Displaying classic Santa Cruz Mountains acidity and length of flavor, 2014 is just now becoming evolved enough to release; a tell-tale sign of long life in the bottle. The fruit was harvested in the second half of August, with a spot-on sugar-acid balance making for the classic style which is the hallmark of our Chardonnay. 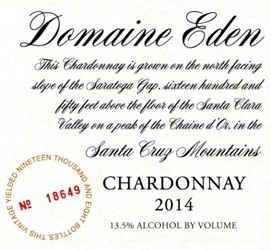 As always, this bottling is a blend of Chardonnay from our Estate vineyards (58%) and our Domaine Eden property (42%). Produced in the same cave with the same methods of barrel-fermentation, sur-lie aging and no finning as we do with our Estate wine, the one key difference is the absence of new oak. It is sure to be enjoyable for at least the next seven years.